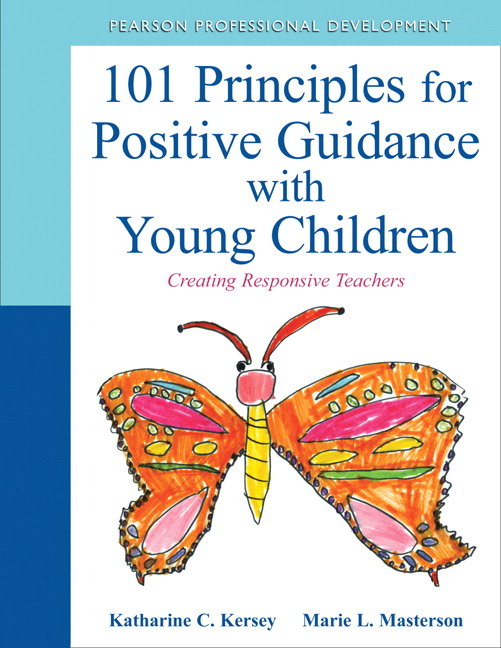 This innovative text provides 101 principles for teachers to learn and use as part of their repertoire in guiding young children’s behavior through positive, respectful and effective interactions. It discusses how to create positive, respectful relationships through strength-based strategies to ensure relational, social, and academic success for all children. 101 Principles for Positive Guidance with Young Children is an innovative manual for educators. It is a handy guide, a reference book, and a daily help for all educators working with children ages birth to age eight. Rather than focus on changing the behavior of children, this guiding text uniquely focuses first on exploring the beliefs, actions, words, responses and strategies of the teacher. By providing effective skills for teachers in behavior redirection and consistent social-emotional support, the authors explain that children will gain the competence necessary to relate successfully with their peers and others and learn to create healthy outcomes for themselves. Lively and accessible, the authors have written a truly user-friendly interactive manual with a seamless link between research and practice. The techniques presented are effective, practical, and field-tested, addressing every aspect of classroom guidance for young children. Furthermore, multicultural and cross-cultural contexts are fully-integrated, with particular efficacy for children at-risk, English language learners, and those working in diverse and inclusive classrooms. Relational and practical solutions for working with parents in the most constructive and caring manner are also addressed and will help educators learn to build bridges between home and school. Versatile in depth and scope, the text can be utilized a myriad of ways from a traditional classroom textbook, a group professional development text, a group facilitator’s guide, or for individual study or enrichment. The text is reader-friendly for teachers, students, and practitioners of every level, and provides for personal reflection and immediate application, allowing teachers to gain confidence in connecting with and relating positively to children, transforming classrooms into caring, positive learning communities. "The skills and tools provided with through the 101 principles of positive guidance have become a permanent fixture in my arsenal. These Tools are more than just methods and philosophies but truly a roadmap to improve the quality of life, self-esteem and future of every single child that we encounter." "Not only have I benefitted from the 101 positive principles of discipline, but also my program and staff have benefitted. The 101 principles have changed our staff's relationships, interactions and behaviors with children and parents, which have improved greatly. The 101s have influenced and given me new insight on what and how I need to evaluate myself and to be a support and role model to other staff. Help children to become self-directed and cooperative. Each chapter provides educators with the tools necessary to guide children’s behavior in ways that are positive, respectful, and effective. Practical illustrations and solutions for creating positive relationships as well as re-directing misbehavior, diffusing power struggles, and creating effective endings to issues that were previously a challenge are all included. Implement the strategies and techniques immediately in the classroom. Each guiding principle is introduced with illustrations for authentic implementation with explicit application for different age groups: children from birth to age three, and age three to age eight. Establish a positive learning climate and inspire a caring community where children feel confident, safe, and eager to learn. Teachers will find the plethora of tips and activities helpful in revitalizing teaching practices and transforming transitions for children. Begin to see the link between research and practice. Each chapter provides a practical format with explicit strategies to support children’s developing social and emotional competence, and authentic classroom descriptions bring to life the experiences and challenges. Feel confident in the content. All content and materials presented in the text are aligned to the national and professional standards and include case studies, role-play, and guided practice. Each section provides explicit language modeling sequences and real-life scenarios for practice and analysis. Adaptations are provided to help readers use the suggested activities and to apply the principles to the unique setting and needs of each school community. Reflect, engage, and understand the content in a deeper, more meaningful way with Think About It sections in every chapter. These offer in-depth reflection questions that link the concepts to active personal engagement and understanding. Learn effective guidance strategies for use with children birth to age eight. Each chapter provides extended tips and activities to enrich language interactions, incorporate music and movement, promote multi-modal learning, and increase engagement for children birth to age three, and children age three to age eight. Hundreds of easy-to-implement strategies for promoting learning while enhancing social and emotional competence can be found throughout the text. Learn how to implement the 101 principles in your own way, in your own classroom. Explicit reflection and activation strategies encourage vital implementation of the principles as you learn skills for behavior guidance, apply new knowledge, and transform the quality of interactions in your classroom. The direct connection between knowledge, reflection, and application is coupled with detailed classroom tips to enhance responsive teaching practice. Delve deeper in the matter with Research on the Run sections. These helpful sections have been developed to provide an intensive synthesis of facts, research results, and resources that support the content of the text. Professional organizations, web resources, research reports and institutes are highlighted to provide an innovative guide to further research and professional learning. Learn from Teacher Tips. Communication from teachers who use the principles provides a rich application of ideas and principles introduced in each chapter. These stories and conversation-active vignettes show the use of the principles, and are designed to inspire ongoing motivation to try new strategies and to illustrate the impact of new practices on children’s responses. Gain positive results using the Principles in Action. Each chapter provides the opportunity for readers to examine what happened that led up to their own interactions with children, to describe how they used a principle, and to reflect on how the interaction was resolved. This application, action, and reflection sequence is integrally related to the effective process of responsive behavior guidance. Make daily use of the Classroom Resources. Developmental milestones related to each chapter, along with the principles provided in English and Spanish, are ready to be used on a daily basis in the classroom and shared with families and colleagues. The book is designed to be used “on the job”: in the classroom through application materials, handouts, and activities. Absolute alignment with Professional Standards. The principles, text, resources, reflections, and activities of this book align with the NAEYC Early Childhood Standards for Professional Preparation Programs, Council for Exceptional Children Standards (CEC), Special Education Early Childhood Specialists in Early Childhood Special Education/Early Intervention (Birth to Eight) (ACC), and the Head Start Child Development and Early Learning Framework. Further engage with the unique Book Study Guide. The facilitator’s guide provides suggestions for division of materials over a semester time frame for those who will use this text in higher education or community college settings. For those who will use the guide for professional development, suggestions are provided for leading training and guiding discussion. The questions and resources provided are meant to provoke discussion, organize activities, and promote higher level learning and reflection, as well as activate the use of principles into practice. Marie L. Masterson, Ph.D., is assistant professor of Early Childhood Education at Dominican University. She recently served as a Fulbright Specialist, working in conjunction with Mahidol University, Bangkok, Thailand to establish an early childhood education training institute. She coordinates Old Dominion University Director’s Institute, which provides professional development for directors of licensed childcare centers for at-risk children. She is a national speaker, child behavior expert, researcher, and author of current articles published in Young Children and Childhood Education linking research to practice in early childhood education. Additionally, she provides educational consulting and professional development to childcare centers, schools, and organizations to build high-quality environments and establish responsive, positive instructional and relational interactions to support achievement and school adjustment for all children. Dr. Masterson is the former early childhood specialist for the Virginia Department of Education.